Salad doesn't have to be limp green lettuce and tired old salad dressing. I believe a salad is a composition of cold or room temperature foods tossed with garnishes and a dressing or sauce of some sort. It's the most encompassing definition I can think of. BestHealth called my name once again, and I demonstrated a few summer salads to attempt to whet everyone's appetite. This Vietnamese recipe has been taken out of the rice paper and transposed to a bowl or platter. 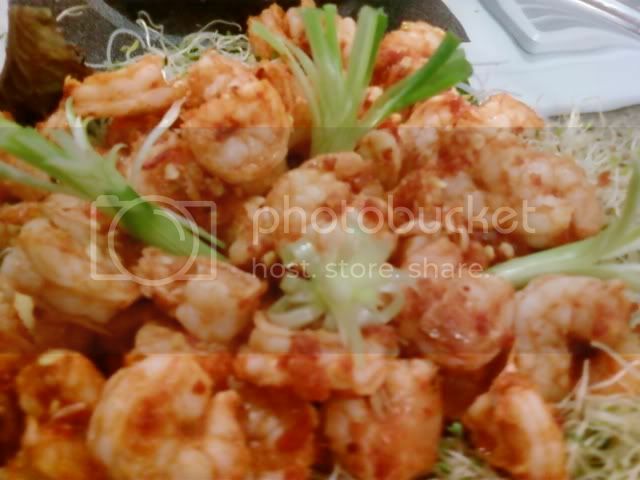 In a medium bowl, add shrimp and sriracha sauce. Toss to coat. Cook on a foil-lined sheet pan for 10-15 minutes at 350 degrees F. Meanwhile, combine remaining ingredients in a serving bowl or dish. 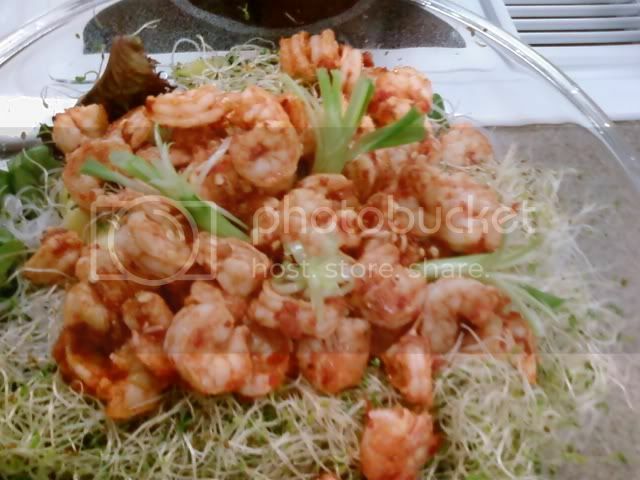 After shrimp have been removed from oven and properly cooled, add to salad mixture. Serve with fat-free salad dressing of your choice. Be careful. The shrimp are spicy. The cool mint and sprouts help cool your mouth. Asian cooking generally encompasses the four seasons: salty, spicy, sweet, and sour. The shrimp are spicy and salty, the mango is the sweet, and if you choose to squeeze a lime over everything, there's your sour. The next salad is a panzanella, which is a bread salad. It's Italian in origin and a peasant meal. The original recipe (well, the recipe I've always known) is stale bread soaked in water (then rung out), basil, tomatoes, olive oil, onions, and sometimes red wine vinegar, too. I decided that I needed a dessert for Summer Salads. Fruit salad has been done over and over. Ambrosia? That's nothing new. 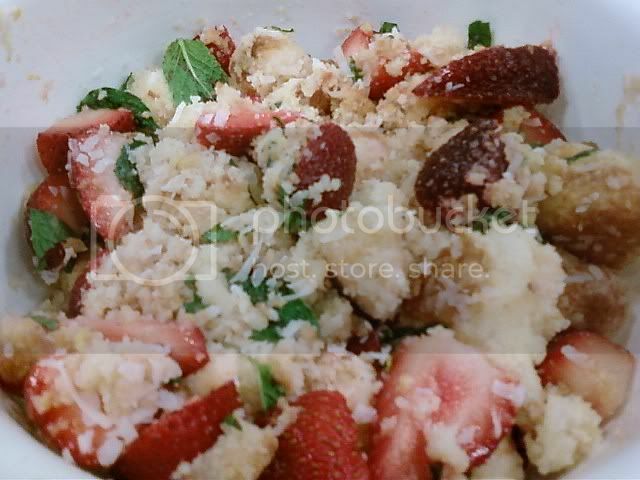 But this dessert panzanella? It's new, fresh, and absolutely DELICIOUS. For real. Panzanella requires that you soak and wring out the cake before assembling the salad. If the cake is stale: soak cake in juice before adding to bowl. If you make this with fresh cake: pour juice over cake in bowl prior to assembly. In a medium bowl, add mint, lemon zest, remaining juice, coconut and toss with your hands or two spoons to combine. Strawberries for tomatoes, mint for basil, coconut for onions, juice for water, and cake for bread. Let it be known that I'll be testing the leftover raw ingredients this and next week. My fridge is full once again. I love the idea of a dessert panzanella, very clever. Well, we're happy that frige is full once again - lol. Um, I soooo love cooking shrimp on a baking sheet. It preserves the flavor and gives it such a better flavor. I like doing various seasoning combos too - chili and lime, butter and garlic - citrus - thyme and garlic - I mean I can go on and on an don with this one. Darius: All day I've been like Oliver: "Food, glorious, food! Hot sausage and mustard! While we're in the mood, cold jelly and custard!" The shrimp were so juicy after cooking them on the baking sheet. Yeah, memorizing flavor combinations and profiles is what separates the men from the boys. Hey Nikki, thanks for visiting my site. I know I've been slow in getting into my new found friends blogs last couple of days, but things are a liitle crazy right now. Boy that shrimp looks good. So glad my hubby's asleep otherwise he'd put in an order for me to go to the store tomorrow so that I could make him some. Nikki, what's Sriracha? Cha Gio salad is so creative! And it sounds very delicious. Ah...desert panzanella. I see what you did there! Now that's something I can wrap my head around. I think I should see more panzas in my future. So Nikki, do you have a recipe for loukoumades ? Someone else also just compared my sopaipillas to these Greek pastries. I'd love to try it. Thanks. I am happy your fridge is full again. I liked the way you transformed a savory dish into a dessert. Teresa: As always, it's a pleasure to have to come by. I'm still getting used to visiting my new blogging friends, too. No, I don't have a recipe for loukoumades, but Ivy at kopiaste.blogspot.com OR Peter at kalofagas.blogspot.com may. Emiline: Thanks! It really is delish. Don: I think I see more in my future, too. Ivy: Thanks! I hope to try changing savory to sweet more often. Nikki - Oh yea, I am really liking that panzanella! What a great creation! I love the angel food cake and the coconut...the whole thing sounds delish! I am going to be trying that soon for sure!